To achieve the same result, i've edited the original files of latest release to same effect. 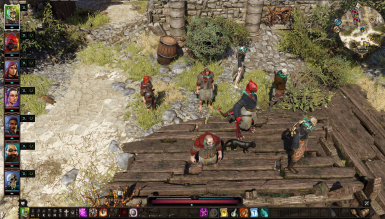 As Expanded party size mod https://www.nexusmods.com/divinityoriginalsin2/mods/24?tab=description is not being updated for some time, i've done some reverse engineering. So if you like you can repeat it in divinity engine 2 to make it yours. or you can download this. His mod idea is great and i'm only sharing it as it was not updated for the last 2 main updates. Please make sure to check the original mod and give him your endorsements. I only repeated his idea into new release. Thanks to Dark Messiah who also confirms it in a new game. Advice: Use it in a new game . IMPORTANT : The mod has changed the "STORY" for single user. When i check the story files, the initializations are quite different for Arena and GM Modes. If you want to use it in Arena or GM Modes, it will not work. WARNING: Do not have all 3 options in your mods file. They will override as they have the same mod id. keep only one of them in your mod folder. 1) Expanded_Party_Size_Updated V1.0-277 :﻿﻿Full mod with all the changes described in Detailed Description. 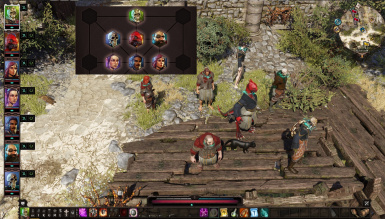 3) Expanded_Party_Size_Updated base-no-dialogue:﻿﻿﻿This means only your first 4 characters that joined the team will make comments. 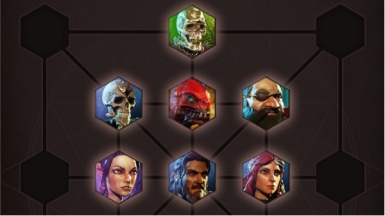 you can have a team of 7 characters. last 3 will not make their comments in party dialogues. Please use this as safer alternative if you are not interested in party dialogues any way. Test Status: Fort of Joy, created a team of 7 succesfully. Also observed comments from all team members for Dallis event. Still, there is a part in reflection dialogues where there might be an issue with only hearing 4 team members. I've not tried with 8 characters. i assume it shall work but as you can see in the edits below, 8th character will not be part of party dialogues. During testing i can see that dialogues are triggering ProcDefineReflectionDialog("FTJ_SW_RD_VoidlingAmbush",_Player); and similar to initiate a reflection dialogue. In my tests, i could not come up with a consistent solution that works for all. in some dialogues, you will observe 4 party members to comment in others all party members. Make sure to recruit the first 4 to be the ones which you want to hear their reflection comments. I could not observe any major issue that affects gameplay apart from this. In game, There are 51 Reflection dialogues and 14 PVP dialogue possibilities. I've observed the first 6 before escaping Fort Joy. Out of 6 , 2 woks for all characters, the other 4 took only the first 4 characters into account only. 1) a bug with party responses. It will be game affecting. It will happen if you use the mod with an on-going game. The only current fix I have at the moment is disabling the mod once you recruit your companions. Just don't dismiss them, and they will still function as normal. You will need to re-enable the mod between acts most likely. For sure, at the start of act 2. Detailed Description: "If you want to create this mod yourself"
1. create an add-on project as "story" selected in divinity engine 2 editor. don't open up any level. go from the menu and select story editor. close and save. After doing the changes, open your mod agin in the divinity engine 2 editor and after going into story editor, try to compile your mod. if it is succesful, you should try play testing.